LEXINGTON, Ky. (AP) — Dak Prescott accounted for three touchdowns, Josh Robinson rushed for two TDs and top-ranked Mississippi State beat Kentucky 45-31 on Saturday. Robinson’s 73-yard touchdown run early in the fourth for a 38-24 lead proved critical after Patrick Towles’ 4-yard TD dive with 2:31 remaining brought Kentucky within 38-31. Christian Holmes’ 61-yard kickoff return TD nine seconds later provided the Bulldogs’ final answer. Robinson, who rushed for 198 yards on 23 carries, capped Mississippi State’s opening drive with a 12-yard TD run. But typical of a competitive series where four of the past six games have been decided by a touchdown or less, Mississippi State couldn’t exhale until the final gun. That’s because Kentucky used big plays to stay close as Towles hit Demarco Robinson for a game-tying 67-yard touchdown in the first quarter and Javess Blue for a 58-yard TD late in the third. Towles’ 48-yard run in that quarter set up his 10-yard run that brought the Wildcats within 24-17. After forcing Kentucky to punt on its opening drive, Prescott completed his first five passes for 56 yards to quickly move Mississippi State into Kentucky territory. But Prescott’s biggest play was recovering his own fumble at the Wildcats 13 after a 3-yard gain, extending the drive and setting up Josh Robinson’s walk-in touchdown on the next play. Kentucky responded quickly with Towles’ TD pass to Robinson that got the sellout homecoming crowd of 64,791 back in the game. If going up to snag the high pass wasn’t impressive enough, Robinson managed to keep his feet inbounds as he came down while shaking off the defender. Robinson dodged a couple more tackles on his way to the end zone, giving Kentucky the momentum boost it needed, and the big play it lacked in last week’s 41-3 throttling at LSU. But the Wildcats weren’t done. Mississippi State scored 10 straight points, converting Braylon Heard’s fumble into Evan Sobiesk’s 26-yard field goal and capping a 68-yard drive with Prescott’s 2-yard run. Austin MacGinnis’ 34-yard field goal brought Kentucky within a touchdown and the Wildcats got another chance to narrow the lead before halftime. Mississippi State began the second half strongly behind leading rusher Robinson, who got the Bulldogs into Kentucky territory with three straight carries for 34 yards to the 28. Prescott finished things off five plays later with a bullish 11-yard TD run for a 24-10 lead that still wasn’t safe. 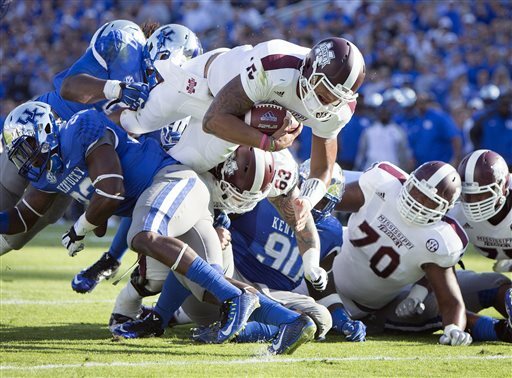 Towles’ 48-yard run to Mississippi State’s 38 and three passes for 33 yards got Kentucky to the 5 before the sophomore was sacked for a 5-yard loss. Towles responded with a gutsy 10-yard run and spin over the goal line for the TD.